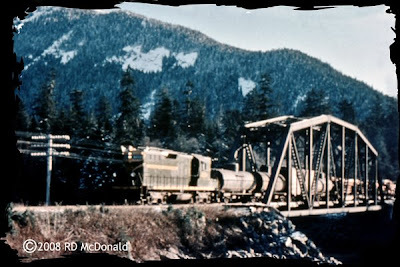 Canadian National Railways 4412, Prince Rupert, March 1959. Winter has once again taken its toll on the Prince Rupert Extension, Skeena Subdivision. I found Geep 4412 marshalling Jordan Spreader CNR 50970 and a cut of Western Air Dump cars, heading out of town under white flags as Work Extra 4412. Judging by the rock in the Western Air Dumps, there will be some shoring up of an embankment somewhere up the line. 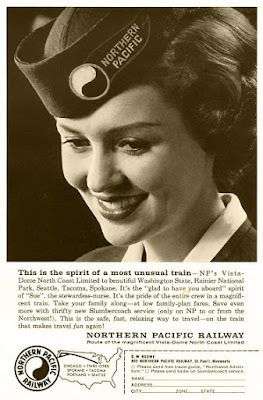 I don’t know if you’ve ever been up close and explored a Western Air dump car. Two large pistons mounted underneath the car body push up either the left or right sides of the car with the side doors flipping open to release the payload. A sign mounted conspicuously on the ends of the car bears the admonition “Do Not Hump.” Hum. So you know what follows, yes? 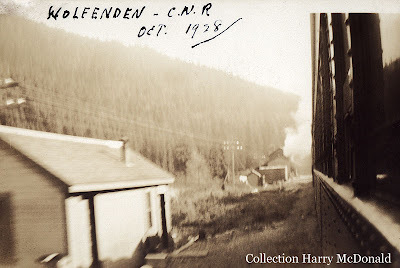 I had been up to Terrace and back one Saturday, riding in the cab of the log train – see previous blog entry. It was late afternoon as we drifted into the yard at Prince Rupert; a flagger brought us to a stop, and directed us onto a particular yard lead. He climbed up into the cab with us, and pointed out the fever pitched activity in the middle of the yard. 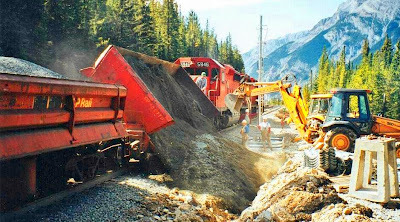 Apparently the switch crew, making up a ballast train, gave a loaded Western Air Dump car a vigorous kick, and when she met up with her mates with a “bang,” there was heard a sudden “whoosh!” and the stimulated dump car dumped a full load of ballast off her starboard side, partially burying two box cars on the very adjacent track, containing the evening Time Table governed freighter! Generator driven lights were brought in, and since the space was so confined, it was all backbreaking shovel work by hand to clear the mess. I would love to have been a fly on the wall down at the Super’s office to hear the explanation from the switch crew! You’ve got to be in the right place at the right time to see these cars in action. When that body lifts up, it is damn impressive! This shot of a car dumping sideways will give you an idea as to what the MOW crew was up against – literally – freeing the adjacent cars and track! 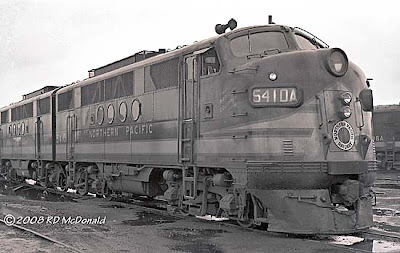 Railroad Stuff: Canadian National Railways 4412, nee 1736, built by General Motors Diesel (GMD) London Ontario, as GP-9, 1,750 horsepower, March 1955, serial number A-655. Renumbered 4412 in 1956. Rebuilt St Charles Shops as GP-9RM 7070, road class GS-418c, in 1992. Apparently alive and well as of June, 2008. Canadian National Railways 4426, Skeen Subdivision, Mile Post 86, October 1958. Winter is coming to the Skeena River Country, and my buddy Mike and I do a couple of photo runs before Highway 16 becomes miserable. The first snows are already evident, and the wind blows damn cold down the Valley. Under cover of white flags, running as Extra West 4426, the solitary geep hurries along near Salvus at top speed for this subdivision, 35 mph. Train crew recognizes “Prince Rupert’s Rail Fan Club” and gives us a tattoo on the air horn. She’s got some fuel oil tankers and 28 log bunks destined for the paper mill at Port Edward. After the set out, she’ll hook up to the crew car, and finish the 10 miles or so into Prince Rupert. There were no radios out here on the Prince Rupert Extension, and a lot of long lonely stretches between anything resembling civilization. I am truly blessed to have been able to experience this wild country. Prince Rupert Daily News, February 2, 1959. CNR reported two large snow slides near Mile 67.9, between Salvus-Kwinitsa. On February 1 at 8:30 p.m. a westbound freight train was hit by a slide. A second slide struck and derailed three cars. One car went into the Skeena River and two onto the highway. Heavy rainfall was reported in the area at the time. Besides the derailment at Mile 42.2, snowslides and washouts occurred between February 1st and 3rd . The largest slide came down at Mile 46.7, measuring a length of 100 ft. (30 m) and a depth of 20 ft. (6 m). The rail line was closed for 45 hours. 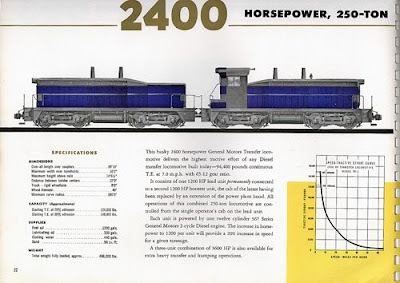 Railroad Stuff: Canadian National Railways 4426, nee 1750, built as GP-9, 1,750 horsepower, by General Motors Division (GMD) London Ontario, Road Class GR-17a, April 1955, serial number A-669. 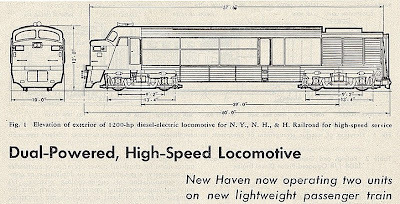 Renumbered 4426 in 1956. Converted to slug 244, road class GY-007, St. Charles Shops, 1990. 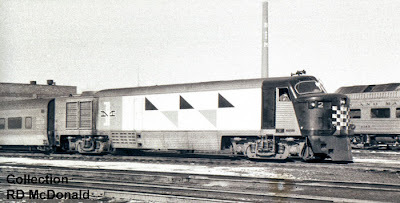 Ran with 7200 series GP-9 Mother units, similar to this setup. 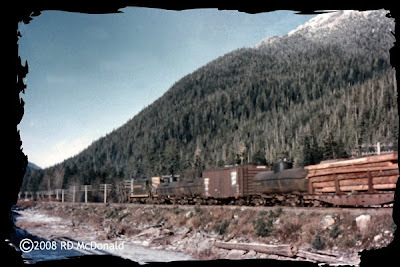 Canadian National Railways 5152, Prince Rupert, 1957. 1st Class 196 with a double header lead by 4-6-2 5152 getting ready to head east. Double headed varnish was not common, but not unheard of when the cannery's were cranking out salmon. Two or three extra express reefers brimming with fresh salmon needed a little boost to market! Departure time was always an electric experience, watching the train crew fussing around with this and that. Then two sharp blasts of that magnificent steam whistle! Hope you have a pleasant Holiday! 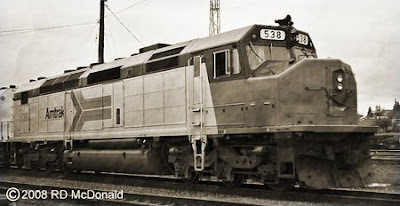 Amtrak 538, Vancouver Washington, 1983. By now I was totally removed from “railroading” as a hobby. I was deeply involved in working on a business plan to establish a new business. 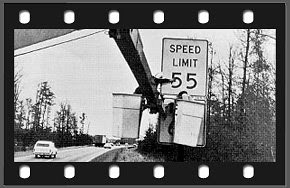 As you may recall, the Emergency Highway Energy Conservation Act of 1974 was signed into law by another doofus serving as president, which made interstate freeway travel at a maximum speed of 55 mph suffering beyond description! 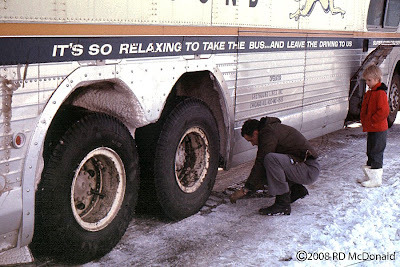 With my folks living in Olympia, my former wife and I did the I-5 from Vancouver numerous times a year. You may recall (if you were driving back then) that after about a half hour of anguish driving on a freeway at 55 mph, you swore you could get out of your motor vehicle and walk faster! I recall passing a double’s – it took 10 minutes to creep by him. 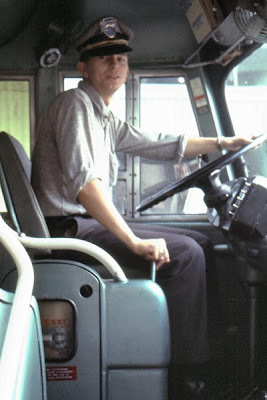 Most drivers in those days were reduced to hideous monsters, with whom you did not want to make eye contact! To avoid the torment, my former wife and I decided to take the train from Vancouver to Olympia for a family reunion. While waiting for our northbound connection, this SDP40F came churning southbound, and the negative for this photo has laid dormant for years. I never even made a print of it ‘till lately. As I understand it, there were some 150 units involved in the transition to Amtrak. 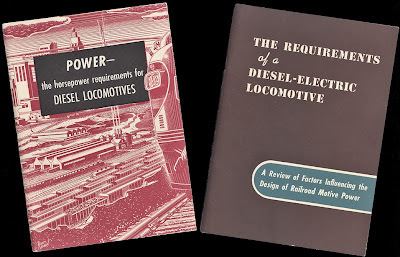 They were plagued by stability problems resulting in more than a dozen derailments at speed – not good for a passenger locomotive! The culprit seemed to be in the so-called “hollow bolster” wheel sets and additional water tanks installed to support a steam generator boiler. Despite imposing 40 mph speed restrictions on certain curvatures, studies by the Federal Railway Administration were inconclusive. And so these units were parted out to become F40PHR’s with this unit being renumbered Amtrak 369. I’m not sure how long it was until these units became history. I do know one of them ended up in the Minesota Transportation Muesum. 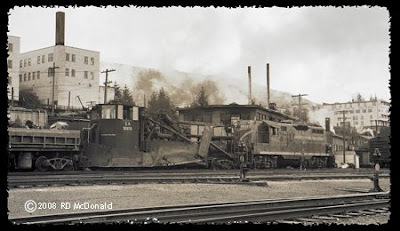 Canadian National Railways 55401, Bucker Plow, Prince Rupert September 8, 1958. 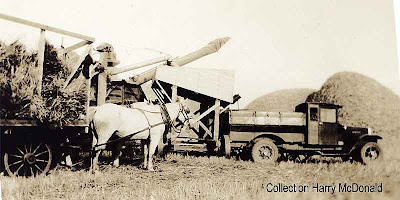 While Prince Rupert had both a rotary and this bucker plow assigned to the Skeena Subdivision, it was this plow that saw most winter action. 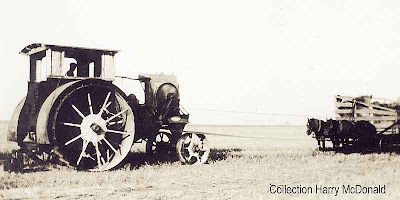 This type of plow seems to have a number of names; wedge plow, pusher plow, bucker plow, but the principle remains the same. Use it early on to keep the line open. 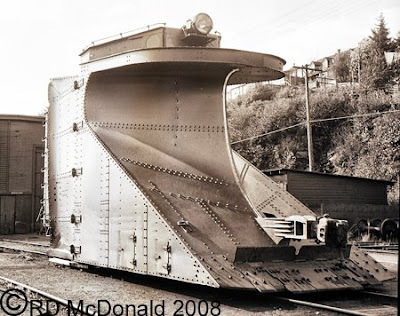 The big rotary, CNR 55361, was called out whenever snow slides occurred. There were two Jordan Ditchers assigned to this subdivision, but I don’t recall them being used to clear snow. But then, it’s been a few years (50+) and there are times when I forget what I went to the kitchen to get! 2. some interesting evening shots – absolutely beautiful! 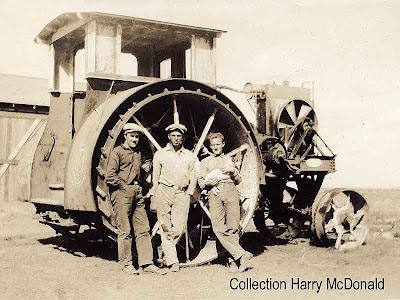 Railroad Stuff: I have no information about this plow. It was such a fixture behind the Engine Facility, that I paid it little attention. 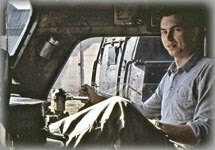 As I recall, the only reason I shot it was that I had just taken delivery of my 2¼” by 2¼” Zeiss-Ikon twin lens reflex camera, and was fascinated by the large square focusing glass. I could count the rivets on the plow had I needed to! 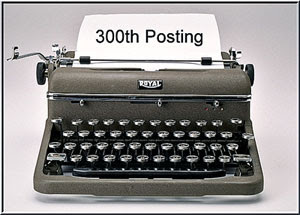 Seems as though we’ve hit another landmark with our blog! And I’ve still got a pile of negatives, slides and photographs to share! Thank you for your continued interest and support! We appreciate your input and comments. Prince Rupert, 1958. Finally the Reader Service Response I had been looking forward to the most arrived, from General Motors, La Grange Illinois! 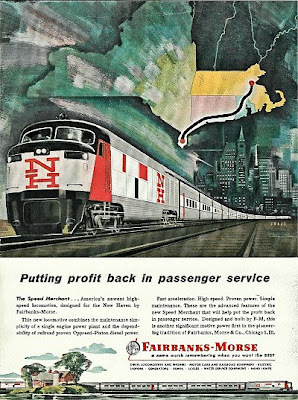 and a Pacific Great Eastern RS-18 came from Montreal Quebec. 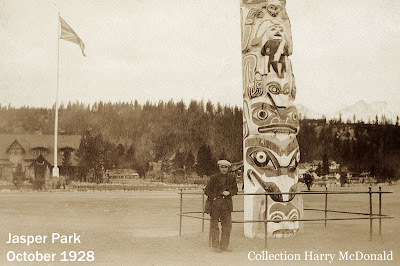 For many years, I lived in Vancouver Washington, about three miles from the wye where the Burlington Northern Santa Fe north-south interstate corridor splits to the east up the Columbia River Gorge. Decided one day to grab my camera and watch several freight movements come and go. All I remember was the monotone shrill sounds of the super blown diesels. I took a few photos, and when I got home, fired up the computer and downloaded my camera. I had no frigging idea what I was looking at. I hit the erase button never returned. 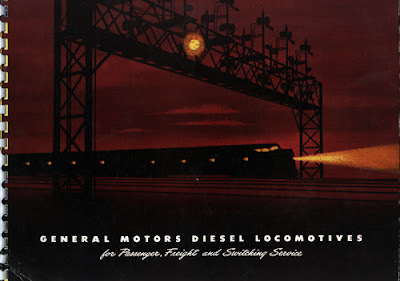 In my “train-chasing career” perhaps the foremost change since the "Great Merger" was the demise of General Motors, Electro Motive Division, along with all the other changes in manufacturers. 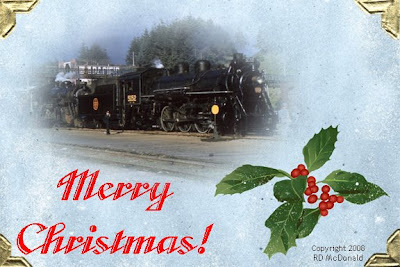 And along came, of all things, a snowmobile builder who now manufactures locomotives? Bombardier Transportation builds everything from snowmobiles to executive aircraft. And I am sure their stockholders appreciate their diversity - although they seem to have problems these days with their snowmobiles! 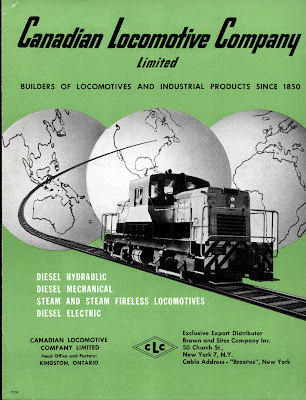 Somewhere along the way, they hooked up with Electro Motive Diesel, formerly Electro Motive Division of London Ontario, and now manufacture General Motor’s locomotives in several different locations, including Mexico. Bombardier Transportation has been involved in Mexico since 1982 when the company of its first contract in the market with Mexico City's Sistema de Transporte Colectivo-Metro for the manufacture of rubber-tired subway cars. 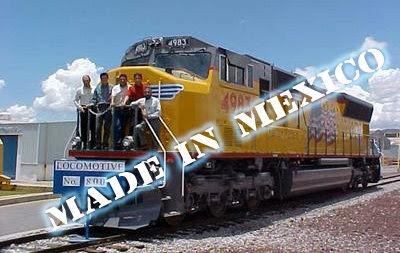 Since 1998, Bombardier's Sahagun ("saw-goon") Mexico facility has produced almost 2,000 locomotives for EMD. 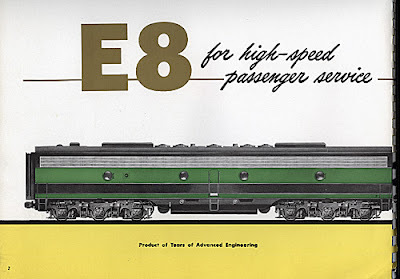 The first units were preceded by a pilot model locomotive, BNSF 9865 erected in London, Ontario. 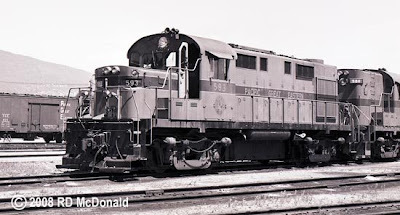 She was then sent to Sahagun as the “training” model used to build Burlington Northern Santa Fe SD70MAC’s, road numbers 9866 – 9942 and 9995 – 9999. And even the current worldwide financial chaos seems to be bypassing Bombardier. Andre Navarri, Bombardier Transport president, reiterated during a recent (October 2008) three-day investor tour hosted by UBS that he believes the current economic downturn poses little threat to the rail division’s $31-billion backlog. 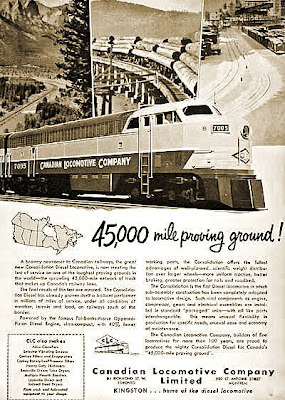 So now the question becomes one of, when one sees a GM locomotive rumbling down the track, how in are you supposed to know where on planet earth it was built? I remember when Lionel tried that .. 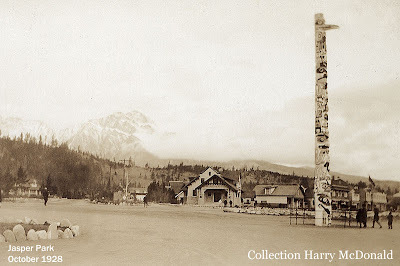 Prince Rupert, 1958. 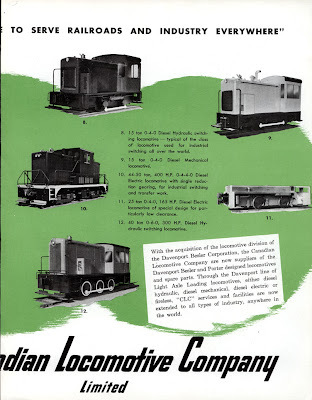 The package from Fairbanks Morse also included a short form product brochure from their Canadian licensee, Canadian Locomotive Company located in Kingston, Ontario. 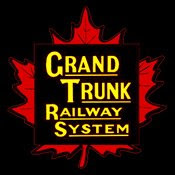 The Canadian Locomotive Company was founded in 1848 as the Ontario Foundry, and through a convoluted series of ownership and name changes, in 1901 became Canadian Locomotive Company, further redefined as the Canadian Locomotive Company, Limited in 1911. 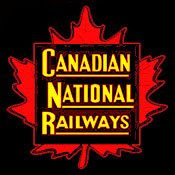 CLC was a major contributor to the Canadian National Railways and its predecessors. 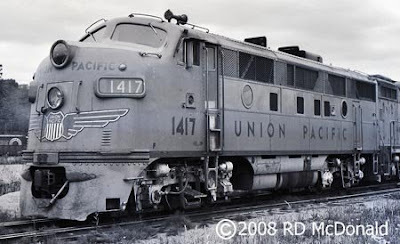 Notable locomotives include the K-1-a Pacific’s, U-1-a Mountains, U-2-a Northern’s, and the T-2-a Santa Fe’s. 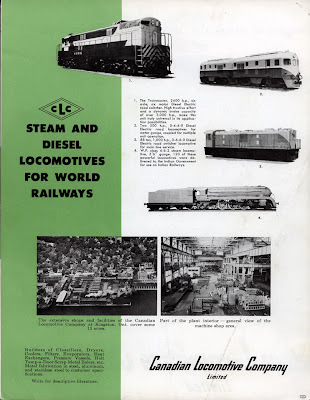 CLC built about ¼ of CNR's steam locomotive fleet. 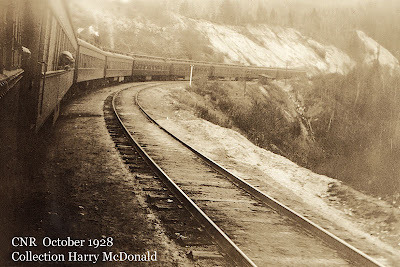 While Canadian Pacific Railway built more that 1,000 steam engines in their Angus Shops, CLC also built a number of steamers for the CPR. 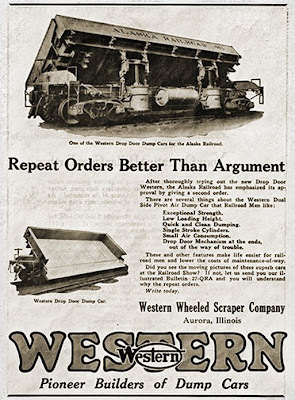 Under license agreements, Canadian Locomotive Company manufactured products from American companies, thereby avoiding costly import fees on units manufactured in the US and sent to Canada. 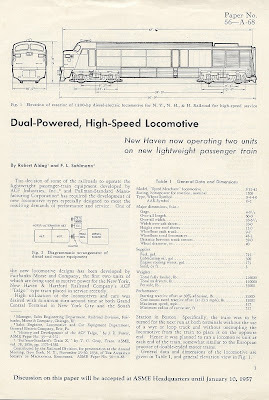 Under such arrangements, locomotives were built for both Baldwin and Fairbanks Morse. 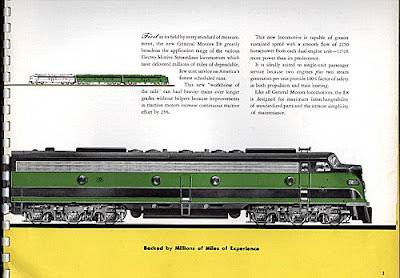 Canadian Locomotive Company built a wide variety of locomotives including dinky 10 ton diesel mechanical mine locomotives, 4-6-2 5’6” gauge steam locomotives for the Indian Railways and Fairbanks-Morse H16-44 and H24-66. 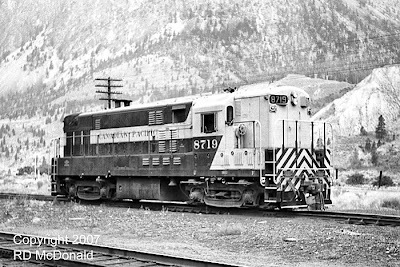 Trainmaster road switchers used by Canadian Pacific, from the early '50's to the mid '70's, operated mainly out of Nelson, in southern BC. By 1974, most units had been scrapped. 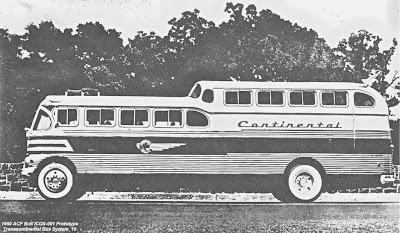 And who can forget the "C-Liners," owned by both Canadian National and Canadian Pacific, chortling along with that unique Opposed Piston motor. 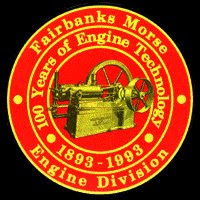 In July 1965, CLC was renamed Fairbanks Morse (Canada) Limited. 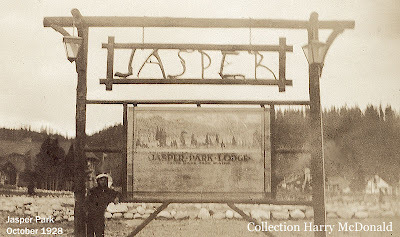 Look for the red builder’s plate, wherein CLC is replaced with Fairbanks Morse. 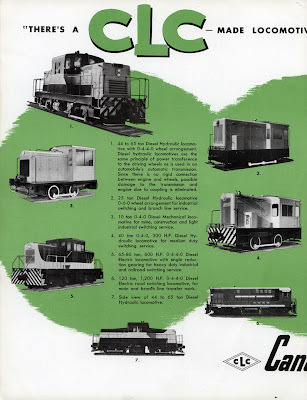 The combination of reduced numbers of locomotive orders and stiff competition resulted in the operation being shuttered in 1969.